1. Honesty may not always pay, but lying always costs. 2. Trust is a tower, built stone by stone, lies take stones from the bottom. 3. There is no security in secrecy; every undiscovered lie is a live landmine. 4. Lies breed a bodyguard of new lies to protect themselves. 5. Lies look very different to the person lied to than the person telling the lie. 6. Rationalizing, justifying or trying to minimize a lie only deepens distrust. 8. 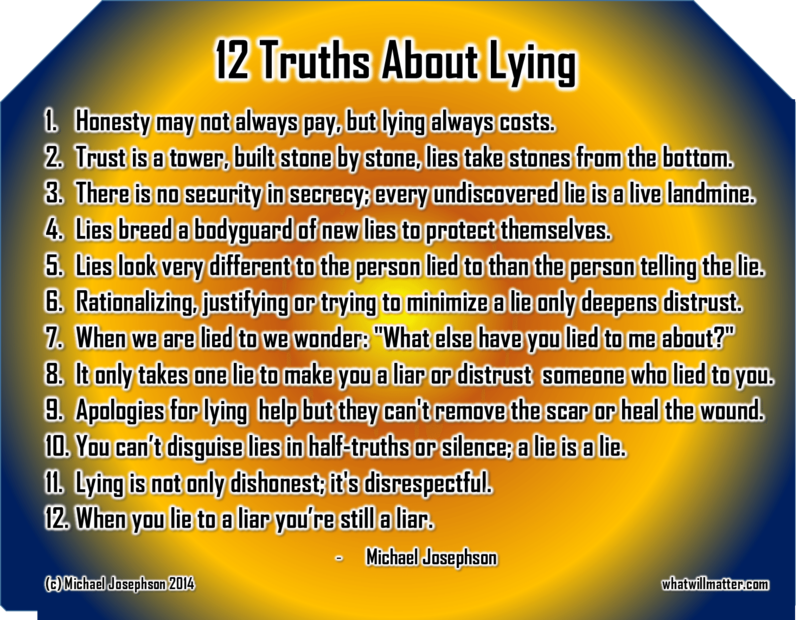 It only takes one lie to make you a liar or distrust someone who lied to you. 9. Apologies for lying help but they can’t remove the scar or heal the wound. 10. You can’t disguise lies in half-truths or silence; a lie is a lie. 11. Lying is not only dishonest; it’s disrespectful. 12. When you lie to a liar your still a liar. I especially like #11. One reason it is disrespectful is because the person telling the lie is, in essence, is assuming that the people he or she is telling the lie to are not intelligent enough to see through the lie. First, we must filter through our own consciences. We then seek an external source: a friend, co-worker, ethics expert, etc. I think that, while good in theory to evaluate internally and externally, it is not practical for daily communication. Most of us will not have a public debate every time we lie about our successes at the class reunion, about our weight on our driver’s license, or use much younger photos of ourselves on that dating website. I feel that we must rely largely on our own personally developed moral code. 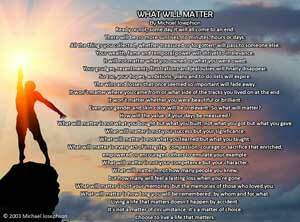 These dozen truths you have shared could serve very well as someone’s personal standards are evolving or for someone who may be re-evaluating their principles. 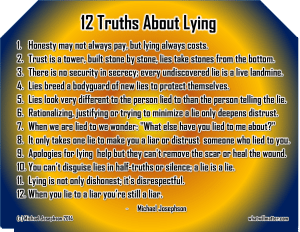 Also, as you have stated in # 10: a lie is a lie. What need do we have to justify lying, if all lies are unethical? Richard L. Johannesen, K. S. (2008). Ethics in Human Communication (6th Edition ed.). Long Grove, IL: Waveland Press, Inc. This is so powerful! And it is so true!! As Christians, how many times do we lie to God. We read our Bibles and make it say what we want instead of allowing it to speak to our hearts. Instead of allowing the Bible to interpret itself, we give it our own interpretation…. We lie to ourselves and to others when we tell others what we think it says instead of allowing them to read for themselves and find the truths God is trying to lead them to…. I am thankful that God blinks at our ignorance and lies. The opposite of a lie is the “Truth”. Jesus said, “I am the Way, the Truth and the Life.” Anything that goes against that, is a lie! I just read 12 things that I do. Not intentional, but still it happens in so many ways. Thank you for calling us to a higher standard and reminding us what it really is! !